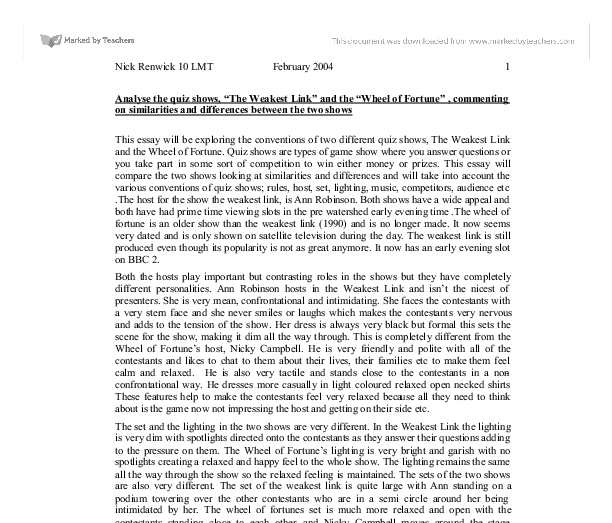 Analyse the quiz shows, "The Weakest Link" and the "Wheel of Fortune" , commenting on similarities and differences between the two shows This essay will be exploring the conventions of two different quiz shows, The Weakest Link and the Wheel of Fortune. Quiz shows are types of game show where you answer questions or you take part in some sort of competition to win either money or prizes. 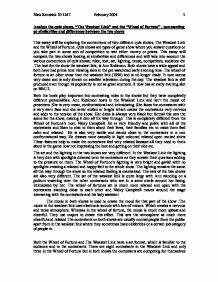 This essay will compare the two shows looking at similarities and differences and will take into account the various conventions of quiz shows; rules, host, set, lighting, music, competitors, audience etc .The host for the show the weakest link, is Ann Robinson. Both shows have a wide appeal and both have had prime time viewing slots in the pre watershed early evening time .The wheel of fortune is an older show than the weakest link (1990) and is no longer made. ...read more. The Wheel of Fortune's lighting is very bright and garish with no spotlights creating a relaxed and happy feel to the whole show. The lighting remains the same all the way through the show so the relaxed feeling is maintained. The sets of the two shows are also very different. The set of the weakest link is quite large with Ann standing on a podium towering over the other contestants who are in a semi circle around her being intimidated by her. The wheel of fortunes set is much more relaxed and open with the contestants standing close to each other and Nicky Campbell moves around the stage interacting with the contestants and his lady assistant The music in both shows is used to create the mood for that part of the show .The music in the weakest link uses electronic sounds with lots of minors. Which creates a nervous and tense atmosphere. ...read more. As far as audience is concerned both shows have wide appeal, as almost everyone will enjoy those shows. The wheel of fortune has always had a greater family appeal partly to do with the show format described above and also the big prizes which are much more exciting then money. People usually watch the weakest link to see the fight between Ann and the contestants. People aren't really that bothered about who wins and how much money they make etc. Both the shows bring in people because they like to join in on answering questions, and seeing if they are better than the contestants. You can see that almost all of the aspects of the weakest link are trying to create a nervous tense and dim atmosphere where as the wheel of fortunes aspects are trying to create an easy going happy atmosphere. Overall I think that, that and the contrast between the hosts are the main differences of the two shows and also the main points that bring viewers to watch. ?? ?? ?? ?? 1 Nick Renwick 10 LMT February 2004 ...read more. The narrator acts as a voice over and is an example of non-diagetic sound. The documentaries use a narrator to tell the story and explain what is happening in a scene. If the narrator is English and well spoken he speaks very clearly and people can easily understand what he is saying. The images were horrific it was shocking to see what one stupid mistake can lead to. By seeing these images I felt sick trying to imagine what would have happened to Jo in the passenger seat. The first thing that I performed was the "club" scene; Tejal and me were playing the parts of Jo and Judy. The moral of the story gets across to the audience -'You shouldn't drink drive, as it is dangerous and could result in serious injury or even death, when it could be actively prevented.' I particularly like the task when we had to re-act the play, but we could take parts of the play to develop and focus on. This shows me that Wednesdays are the most popular days for shows and Sundays are the least popular days. The first game show I watched to analyse was Call My Bluff. The host of Call My Bluff is Bob Holness aged in the 50s. The aim of the game is to answer all fifteen questions and win a million pounds. The first five questions are moderately simple. This is to show that anyone can do it and it makes people feel superior. Once you have answered the five questions you have unquestionably reached �1000. This is completely different with the wheel of fortunes Nicky Cambell. He is very flirtatious and polite with all of the contestants .He likes to chat to them about there family and he also gets very close to them by putting his hand on there shoulder and so on.